Cost/Amount: USD$7.75 for 1.2 grams. Sample baggies also available. 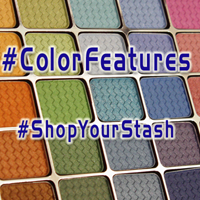 This collection was created using the same metallic-finish as Aromaleigh v1’s Elemental Lustres, but without the sootiness that I’ve found in many metallic collections and colors (both from Aromaleigh and from other manufacturers). In the pot, many of these look like they'd be tinted greys, rather than full-on colors. That's deceptive, though. All apply with a definite color, and a rich metallic finish. I was most excited to see a black metallic in this collection, because true black metallics don't seem to happen very often. Or if they do, either they're more pigment than finish, or they're quite sheer (like Bare Escentuals' Black Ice, which, while pretty, is far less Black and far more Ice.) 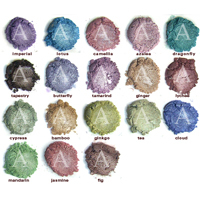 I do use a base with these colors, otherwise they wouldn't stay on my heavy oily lids very long; but I don't have to foil them to bring out the colors or to get the metallic finish.